I hope you guys had a great weekend! We celebrated Austin’s birthday and spent the day at the pool yesterday. It was 80 degrees and so beautiful out- it had me itching for bbq’s, pool days and margaritas! Speaking of, can you believe it’s already April? We have some fun things planned this month that I’m so looking forward to! Are you heading anywhere on Spring Break? If so, I’ve got some swimsuit content coming up this week that will hopefully help you plan for your getaway. Every month I love to take a look back at the prior month and share the most popular items according to you guys. These are the goodies you guys purchased the most based on what I posted on my blog and Instagram. Let’s get to it! 1.) Open Front Blazer– Guys, it’s no surprise this was the #1 purchased item last month! This is the perfect blend of cardigan meets sweater meets blazer. I love the camel color but it comes in 8 other fantastic colors too. 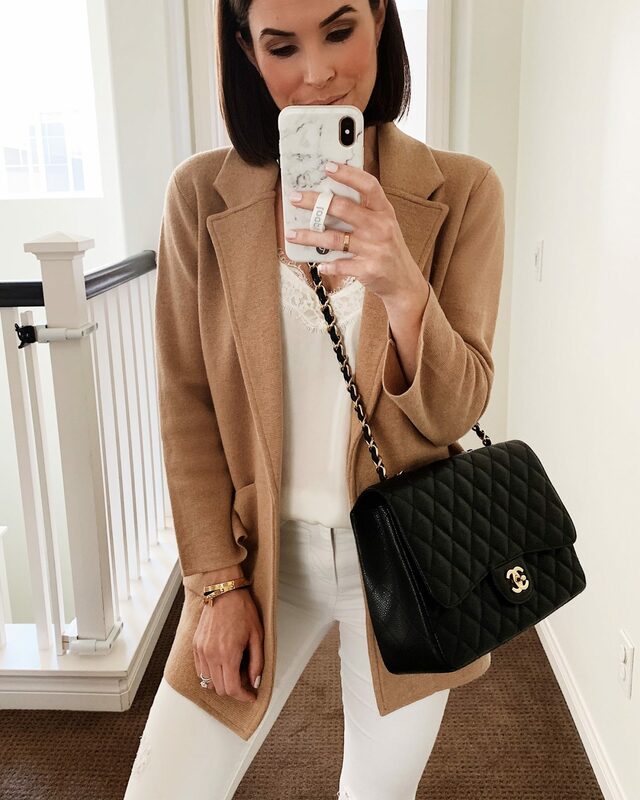 I can’t recommend this enough- I wore it for dinner Saturday night with my favorite white jeans but think it would be the perfect workwear look with some classic black pants. This is definitely a closet staple! 2.) Jean Jacket– I tried a lot of jean jackets before I stumbled upon this one. It has excellent reviews and runs tts! Pair it with leggings, shorts, over maxi dresses- this is such a versatile piece! 3.) High Waisted Grey Jeans– So these are not the exact grey jeans I posted in this photo. Mine are a few years old and I couldn’t find them online. But these are SO similar. I LOVE a monochromatic look and think this colorway is amazing for denim and can be worn year round. Pair it with a classic grey t-shirt or tank or a lacy camisole to dress it up! 4.) Cutoff Shorts– These have a cult following and I can see why…the fit is great- they aren’t too short and there are a few washes to choose from. I was in desperate need of a great pair of cutoffs and I’m so pleased with these. 5.) Paperbag Shorts– You guys went bananas for these paperbag shorts from Target! You cannot beat the price point (under $23) and they can easily be dressed up or down. For a huge selection of paperbag shorts and pants, you can check out this post here. In the meantime, I can’t wait to share these when they arrive (hopefully this week! ).